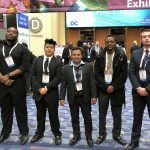 ECSU students Alton Turner, Jonathan Lopez, Alex Phifer and Alex O’Connor were awarded Transportation Research Board fellowships at a conference last month in Washington D.C. They attended the conference with dean of math, science and technology and aviation program director, Dr. Kuldeep Rawat, center. 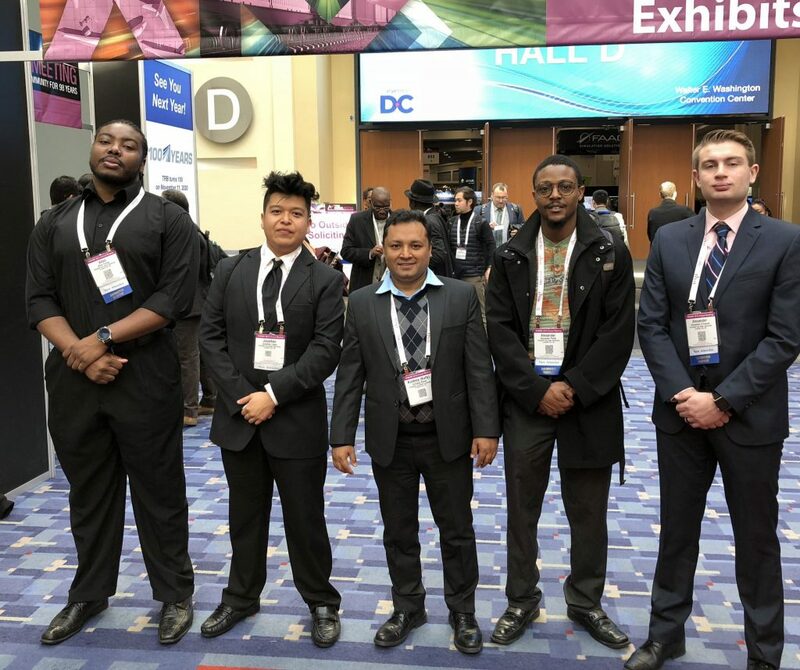 Four Elizabeth City State University students attended the 2019 Transportation Research Board (TRB) conference last month, and each was awarded a fellowship. According to Dr. Kuldeep Rawat, dean of math, science and technology and the aviation program director, Alton Turner, Alex Phifer, Alex O’Connor, and Jonathan Lopez were each awarded a TRB fellowship. The TRB is a division of the U.S. Department of Transportation, and the conference took place in Washington D.C.
Turner, an engineering technology student, was awarded a $10,000 David Dwight Eisenhower Transportation Fellowship; Phifer is studying aviation science and he was awarded an $8,000 Eisenhower fellowship; Aviation science major O’Connor also received an Eisenhower fellowship for $6,500; and Lopez, an aviation science major, received a $1,500 TRB fellowship. According to Dr. Rawat, Lopez gave an oral presentation at the conference, while O’Connor did a poster presentation. Turn and Phifer will be presenting at the next TRB conference, said Dr. Rawat. According to Dr. Rawat, an internal review board consisting of three ECSU faculty members and one staff person from the Federal Highway Administration’s Raleigh office, ranks the student candidates for the fellowships. The final decision is made at the Federal Highway Commission office in Washington D.C. This is the third consecutive year ECSU students have received these fellowships. In addition to the fellowships, aviation majors Clayton Brand, Brandon Cowan, and Bryana Williams, and engineering technology major Jeffrey Smith, were all awarded $2,500 North Carolina Department of Transportation scholarships .